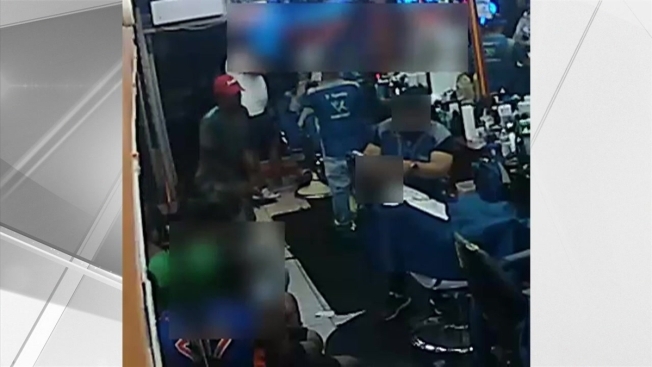 Two armed men held up a barbershop in the Bronx, shooting an employee and stealing his jewelry before taking off, police say. The two robbers targeted a 40-year-old employee at D’Agustin Barber Shop on 170th Street in Mt. Eden on Friday night. The NYPD released surveillance video of part of the robbery on Sunday. The video shows one of the suspects pulling out a gun and pointing it at the employee as he styles someone’s hair. The suspect tried to take the employee's gold chain and bracelet at gunpoint, police said, and when the employee resisted, the second suspect pulled out a gun and fired several rounds, hitting the employee in the arm and abdomen. The employee was taken to St. Barnabas Hospital in stable condition. The two suspects got away with the gold chain and bracelet, police said.